48Vdc systems up to 600A maximum load current. 24Vdc systems up to 500A maximum load current. The UL listed Eaton DV2-3G Metro Power Solutions are ideal for low to medium power telecommunications applications requiring compact, efficient and flexible DC power. Typical applications include standby DC power for customer premises equipment, outdoor shelters, VoIP, PABX, data networks and IP routers. The DV2-3G Metro series has up to 40kW of output for load and battery recharge. It features state-of-the-art Access 3G, or Energy Saver rectifiers, an integral DC distribution panel with easy to fit plug-in hydraulic magnetic circuit breakers, and optional low voltage disconnects (LVD) for battery and non priority loads. 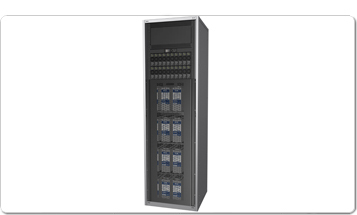 Each cabinet has fitted integrated battery shelves for up to 4 strings of 48V, or 8 strings of 24V, high capacity VRLA batteries. Optional battery cabinets for extended back-up time are also available. A technician friendly user-interface includes a full color menu screen and is pre-configured for fast installation and easy commissioning. System settings are fully adjustable in software and stored in transferable configuration files for repeatable one-step system set-up.